Bought a peach tree at one of the box stores. Looks to be healthy. It stands about 3 ft tall and has about 8 walnut size peaches on it. Should those peaches be cut off? I would remove them. This will allow the tree to focus on growing roots and becoming established. 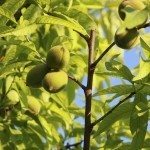 There is a high likelihood that the tree would abort the fruit anyway, but the sooner you remove them, the sooner it can focus on what it needs to in order to survive and do well in your yard.